So much to catch up on as Faith Ed, my book on teaching about religion in the schools celebrates its ninth month of existence. 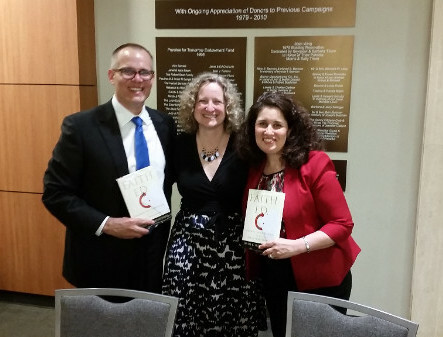 I recently traveled to Dallas to give a talk for the Jewish Book Council. Pictured with me above are: Mark Chancey, a religion scholar from Southern Methodist University, who participated in a panel with me and Rabbi Steve Gutow, and the panel moderator Cheryl Drazin. Cheryl led us through a discussion on the issues covered in Faith Ed, including some of the controversies over lessons on Islam as well as success stories on how courses helped reduce bullying. Professor Chancey added a wonderful layer, given his research on the issues with Bible courses in Texas public schools. Rabbi Gutow talked as well about some of his interfaith work and his reaction to what he learned from Faith Ed. On the same day as the talk, my former employer, The Dallas Morning News ran an op-ed of mine, where I make the case for using education to reduce religious bigotry. For those of you who’ve read Faith Ed, you’ll get to read a bit of a followup about Zach Kellas, who had spoken out at a Lumberton, TX school board meeting to support his geography teacher. If you didn’t see it, I highly recommend checking out a PBS NewsHour segment this week about the experience of Somalian Muslims in St. Cloud, MN, schools and how the school system is now trying to reduce the teasing and bullying. It’s a joint Education Week/PBS NewsHour story and reminds me of Bedford, MA’s efforts to reduce anti-Semitism. St. Cloud schools are confronting the issue holistically with student initiatives, such as peer leaders, and cultural awareness. The one element I didn’t hear: How teaching about religions, including Islam, could play a role as well. 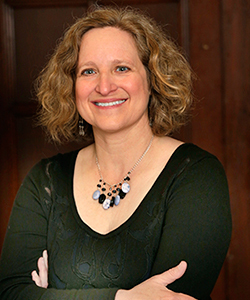 I’m excited to announce as well that I have been asked to participate in an all-day religious literacy workshop at Harvard Divinity School on July 9. I will be one of several speakers, including author Stephen Prothero, Diane Moore of Harvard, Nate Walker of the Religious Freedom Center at the Newseum, and the conference organizer, Vincent Biondo, a religion scholar from California State University in Fresno. It is a public event. Speaking of events, I recently signed up with the new Read On Speakers Bureau of the Jewish Book Council. What that means: You now have an easy way to request me for events at your organization, whether it is Jewish or not. You can email readon@jewishbooks.org to find out more. Things Not Seen Podcast on Faith Ed: Many thanks to David Dault for interviewing me on his podcast, Things Not Seen. The episode aired May 2. 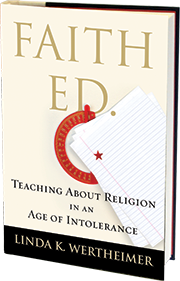 Faith Ed on TV alert: In late June, CBS television’s Religion & Culture program will include a segment on teaching about religion and interview with me. 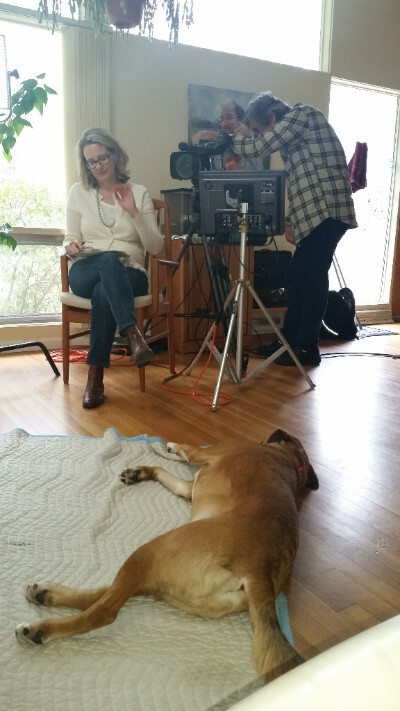 Many thanks to producer Liz Kineke and her crew for coming out to my home to conduct the interview. The entire 30-minute segment will focus on religious intolerance, a topic near to my heart, of course, and so critical to confront in today’s times. The air date is scheduled for June 26, but stay tuned for more information as June approaches. It will air at different times depending on the city and also will be posted online. Watch out for more news in upcoming newsletters about the paperback launch of Faith Ed. As always, thanks for reading. Ps. 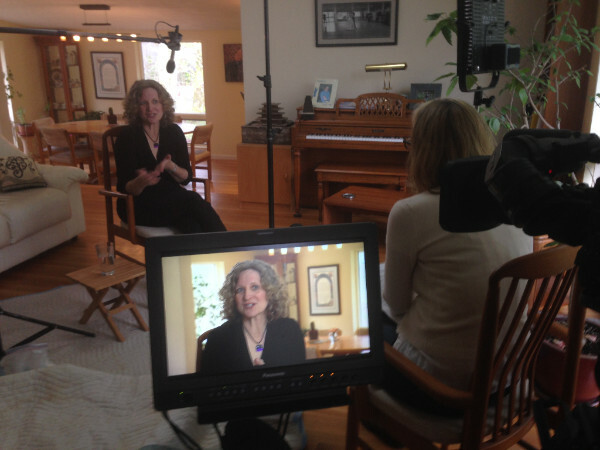 Below are some photos from the television filming at my house. This is during the actual interview with producer Liz Kineke. Sometimes, Bernie, my 2-year-old dog, just has to steal the show. During set up, he made himself at home on the mat set up to protect the floor from the camera equipment. He did not, however, take kindly to a crew member trying to get him to ‘speak’ in the microphone. He was a bit skittish of the mike, unsure what it was. But he may make the cut in filming in my office. We’ll find out next in June. Tagged CBS Religion & Culture, Dallas JCC, Dallas JCRC, Faith Ed, Harvard Divinity School, Jewish Book Council, Liz Kineke, Mark Chancey. Bookmark the permalink.